Movie: "Ralph Breaks the Internet"
When the steering wheel on the Sugar Rush game breaks, Ralph and Vanellope go into the internet to try and find a replacement on eBay and wreak havoc while they are there. "Wreck-It Ralph" is done exploiting the nostalgia of the 8-bit gaming that was popular in the '80s and '90s. 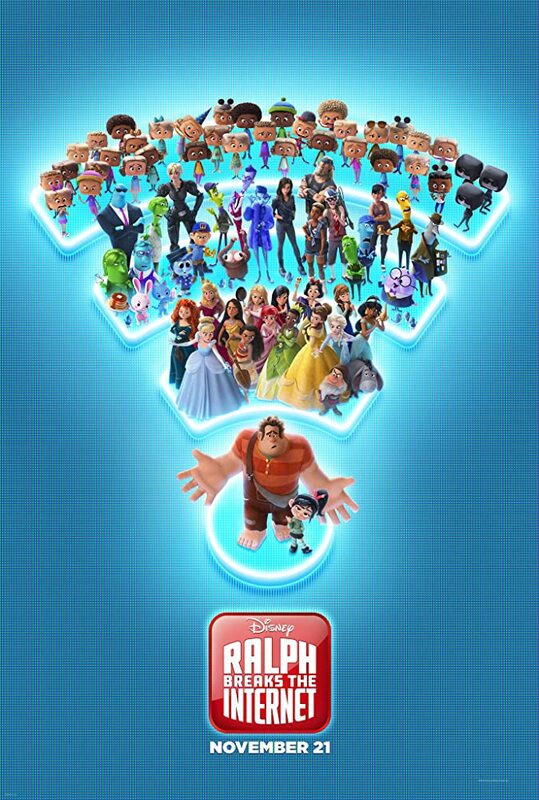 Now, it is ready to dive into the more modern pop culture of the online universe with "Ralph Breaks the Internet." This film is directed by Phil Johnston and "Wreck-It Ralph" director Rich Moore. It has been six years since Ralph (John C. Reilly) met Vanellope (Sarah Silverman), and the two have become best friends and spend all their time together. Vanellope has expressed her displeasure with the expected nature of the racing tracks in her game Sugar Rush. Ralph, being the kind-hearted friend that he is, builds her a new detour track, but when Vanellope winds up fighting with a player over which direction to go, the steering wheel on the Sugar Rush game inside Litwick's Arcade snaps off and breaks in half. In order to get a new one, Ralph and Vanellope head to the recently installed internet to get a new wheel on eBay since they are no longer readily available. Once they are in the internet, Vanellope starts to fall for its unexpected nature and contemplates leaving the arcade for a permanent home online. "Ralph Breaks the Internet" is what "The Emoji Movie" desperately wishes it could have been if it hadn't been so obsessed with making poop jokes for 90+ minutes. This film is loaded with references and product placements that tap into the cultural zeitgeist of the modern day internet. We see references to Twitter, Amazon, Google, eBay, and YouTube, as well as other popular websites and app spin-offs. The story has some commentary on how people interact and act online and visualizes this concept in very creative ways. There is also a heaping helping of self-aware humor when it comes to Disney as far as how their princess culture has been depicted in past films. It gives these previously damseled ladies a chance to shine for once, and they do so in a hilarious way with tons of princess-themed puns. Though much of the humor still thrives in pop culture references, the overall theme of this sequel is friendship. It's all about Vanellope and her dream of doing something new and adventurous and whether that dream will test her loyalty to Ralph. Ralph wants to be with his best friend all the time but doesn't realize that in doing so, he is actually hurting her. Vanellope's fear of hurting Ralph holds her back from doing what she really wants to do. These are mature themes for a kids movie, but somehow, Johnston and Moore make it work in an equally fun and endearing way. John C. Reilly and Sarah Silverman do yet another spectacular job in their respective roles. They really fit their characters perfectly! We also get some fun newcomers as well, such as the fierce, tough-as-nails Shank (Gal Gadot), an online racing final boss, Spamley (Bill Hader), the annoying but misunderstood and helpful popup spam ad man, and Yesss (Taraji P. Henson), a trendy top website algorithm who helps Ralph and Vanellope when they are at their most desperate. We wound up really enjoying what "Ralph Breaks the Intenet" had to offer! It certainly brought the laughs for us. The voiceover work is excellent, the animation is vibrant and entertaining, and the message is hefty, but it's the ideal one for kids and adults to hear. It also has a hilarious mid-credit and after-credit scenes that are worth sticking around for, so stay in your seat until the credits are over. Disney has created a greatly successful sequel in our eyes, one that is just as good as its predecessor, which is not easy to do in this day and age. This one is definitely worth checking out.